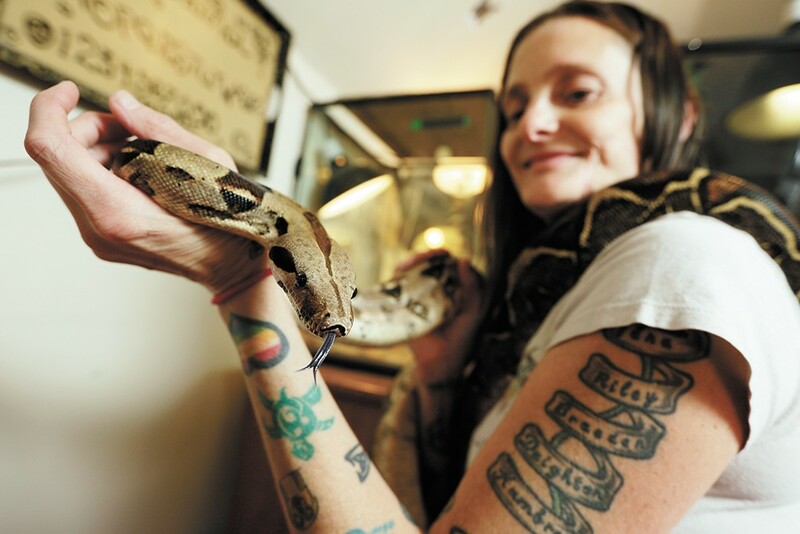 Tonya Hinshaw holds a rescued red-tailed boa at her home-based reptile rescue, Reptile Domicile. Though she grew up with bearded dragons as pets, Tonya Hinshaw can actually thank her son for catapulting her into the world of reptiles. "My son has Asperger's, and he's actually the one that got me into snakes," Hinshaw says. When he was in preschool, back in 2005 or 2006, they had a reptile day. "The teacher brought in a corn snake, and he was obsessed with it," she says. "Later it was a calming technique for him. Instead of rocking in a chair, he was able to sit with a snake on him and be fine." The only problem was, Hinshaw was terrified of snakes. "I grew up with rattlers being around, so I wanted nothing to do with snakes," she says. Still, seeing how much they helped, her family bought some harmless corn snakes, and as they grew from pencil sized to more than 4-foot long pets, she became comfortable around them. Hinshaw always had a knack for helping one injured animal or another from the time she was a young kid and had considered becoming a veterinarian. Around 2011, she decided to start rescuing reptiles, learning what she could from other reptile enthusiasts and the internet before launching Reptile Domicile. Now, she gets animals in from all over. Hinshaw lets people know she'll take in needy reptiles with posts on Facebook, Craigslist and a website she's currently updating. She's had rescues come from as far away as Missoula because there aren't many other options around. The types of reptiles she takes in vary considerably. Currently, she's got a chameleon, a bearded dragon, a leopard gecko, a red-tailed boa and some corn snakes, not counting her family's own pets. Most of them come in healthy, but are surrendered by people who didn't realize what they were signing up for. "The most common issue is iguanas. They buy them when they're small and don't realize how big they get," she says. "Some of them, like the chameleons I get in, it's because people don't realize how delicate they are." For now, the rescue is set up out of Hinshaw's family home near Gonzaga Prep, where she also juggles life with four teenagers. She raises feeder mice and sometimes rats as needed, as well as mealworms. She'll go to the store if she needs crickets, and every once in a while she gets donated help — recently it was a huge donation of feeder mice. Once the animals are healthy, she posts them on Facebook and finds them new homes, screening people to make sure they'll be a good fit. Hinshaw has wanted to officially get 501(c)(3) nonprofit status for Reptile Domicile for a while, and started pursuing it back around 2013. However, the process has taken some time due to family life taking priority, but she says she's started the process again and is hopeful she'll soon be a nonprofit rescue. "The kids came first, but now everything can kind of move forward," Hinshaw says. Mark Schrag, a veterinarian at Hunter Veterinary Clinic, highly recommends speaking with a vet about the unique challenges of a specific exotic animal — whether that's a rabbit, chinchilla, bird or reptile — before going out and buying one. "There's no one cut-and-dried rule that applies to all reptiles," Schrag says. "Their care is often very different from what we think of for a standard dog or cat; often we can't just get kibble off the shelf to feed to them." Hinshaw recommends the same thing: Do your research ahead of time. Often she gets rescues because people didn't know enough about what they were getting into, from size requirements to how to handle them to keep them from becoming aggressive. "Probably 90 percent of cases I see are preventable or made worse by things not being done right," Schrag says. "The most common things I see would be complications from an unbalanced diet. Calcium deficiency is incredibly common in exotics." That can happen because of a lack of exposure to ultraviolet B, which we typically get from the sun, and helps with absorbing calcium, he says. Other animals that don't have as many issues with UVB, such as snakes, may have other issues like respiratory illnesses, because oftentimes they're kept in fish tanks without great ventilation. 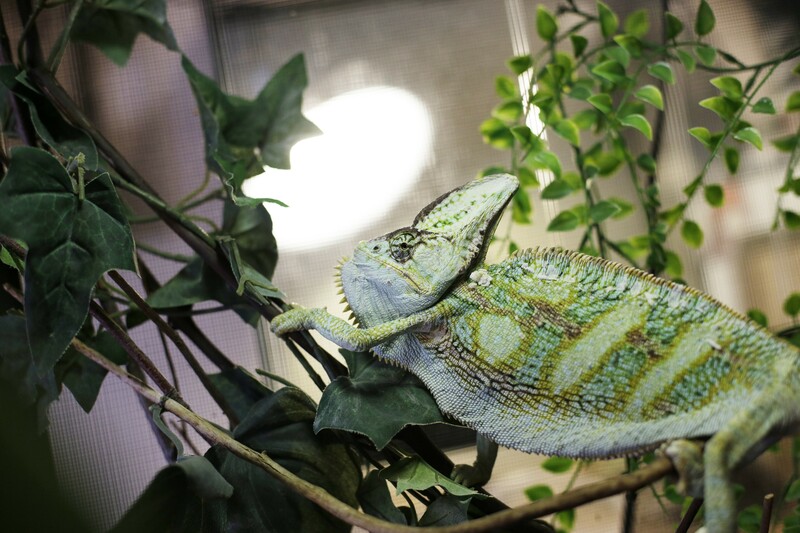 For questions about how to care for exotic animals, Hunter Veterinary offers walk-in availability from 2-6 pm, Monday through Friday, and 9 am to noon on Saturday. If you've already got an established veterinarian, Schrag recommends calling them to make sure they're comfortable caring for your new pet. The original print version of this article was headlined "Cold blood, Warm Hearts"